No one would have believed, in the last years of the nineteenth century, that human affairs were being watched from the timeless worlds of space. No one could have dreamed we were being scrutinized, as someone with a microscope studies creatures that swarm and multiply in a drop of water. Few men even considered the possibility of life on other planets and yet, across the gulf of space, minds immeasurably superior to ours regarded this Earth with envious eyes, and slowly and surely, they drew their plans against us. Ever since its publication in 1897 (1898 if you don’t count serialization as publication), H. G. Wells’ The War of the Worlds has been adapted to a variety of media: stage, radio, comic book, and, of course, movies, each one worse than the one before. 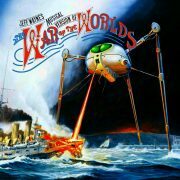 And of course, there was the concept album, Jeff Wayne’s Musical Version of the War of the Worlds, whose introduction I quote above.